Here is a quick preview of some of the outfits I will be wearing in Florida. We are leaving tomorrow night, after my second photo class, and I absolutely cannot wait. Packing has made the trip even more exciting; seeing my beach outfits just reminds me that soon I'll be tan. The ICP photo class has been amazing and spending time with my dad has been even better. I can't wait to learn more tomorrow. I think I'm going to have to upgrade from Photoshop CS3 to Photoshop CS5. Lastly, this Topshop clutch was a graduation gift from my BF. It's studded all over! I can't get over how much I love it. Everytime I see it it makes me smile (studs.. ah!) I wish I had purchased it in black as well. By the time I recieved it in the mail, and knew I needed another one, the black had sold out! Perhaps they'll bring it back someday, who knows. I decided to tint these photos a little orange, I think it gives them a nice vintagey feel. For those of you on Spring Break... have a wonderful break! I shall be back next Saturday with tons of great pics and an even more incredible tan. Have fun! My sister just got back from FL and had a blast! Have a great trip and love those outfits! Great idea to prevent over-packing... have a great time! You are so lucky! I can't wait for spring break to come! Looks like you have everything though for a great week! wow! love this pictorial layout. i really want that madewell "Hello" tee so much! hope you have a good time in Florida! can't wait to see the pics! by the looks of it, you'll be great in all of the pics! the geren ford blouse looks amazing. adorable outfits i love the first one/ the polka dotted romper!! Nice outfits, can't wait to see the pictures!! Lucky lady! No spring break but at least one of us will catch a tan! Wowww! Beautiful romper, dress and blouse! I love them! I love this! Such fun photos, and great pieces to pack! Loving the clothes you're packing! The polka dot romper, sequined shorts and balenciaga bag are my favorite. :) Have fun! Gosh, makes me want warm weather so bad. Love how you put together your outfits, can't wait to see you wearing them, speacially those sequined shorts and Alexa's tee! Hope you enjoy and have lots of fun! Stop by after you break and say hello. My give-away should still be running so make sure you enter for some lovely wins! These are such great looks, love the romper in the 1st pick! great outfits!!! it's nice and warm down here! make sure to grab a cardi for the night time breeze! Have fun. so cute, love the polka dot and the madwell dress. Great outfits, love the Balenciaga and sequin shorts, have fun in Miami. What a great idea to plan out your outfits that way. loving the romper and the sequin shorts, great way to plan them out! i love those sequin shorts! You're a good packer...I would never be that organized. good luck with the tanning process !! you look like you're having a great wardrboe for the trip there ! I love the one shoulder dress, perfect for Florida! Nice outfits. I like the wedges. ohh have fun!! pretty jealous right now haha, I want to pull out my bikinis as well!! make sure to take lots of pictures of the pretty weather haha! Hope you have a nice trip dear! Can't wait to see the pictures! I LOVE the second photo! But all of the outfits are great! love love love the pics! come check out a pic from our vintage clothing shoot we did this weekend! so much new vintage clothing coming to the site! come check it out and get 20% off your first purchase! great sense of style and eye for outfits..
You're so lucky! Have fun in FL! :) Love the outfits you put together! Oooh, I'm packing for vacation too! Have a great time!! Love the clutch, especially the studs all over it. i really like the playsuit! cute. That romper is ADORABLE. I love it! All of these outfits are lovely. I want those shoes. I need some wedges in my closet. You've picked great outfits :) Have a blast. Great outfits, I love the romper!! 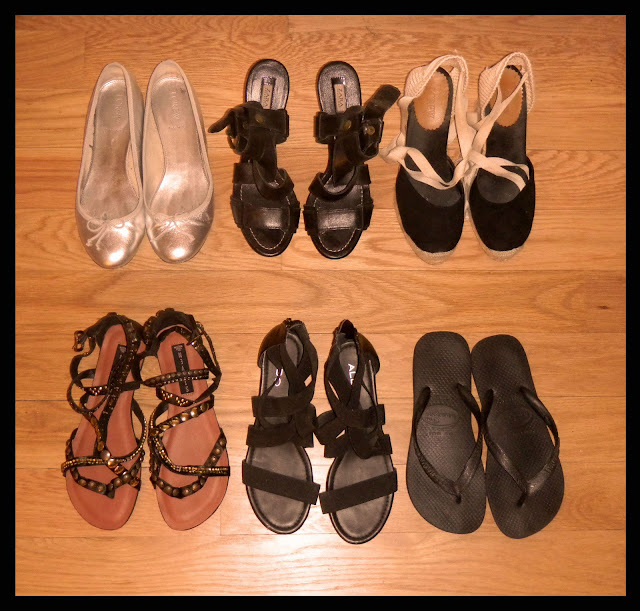 The steve madden sandals and alexa chung top are great! Have so much fun! loving the polk a dots! and crushing on those sequin shorts-oooh la la! LOVE the sequin shorts! great vacation gear! nice outfits! have a great time in FL! oh! this and the las t post are great! amazing girl, amazing! That sounds like so much fun! Have an amazing time! I also love your studded bag! When did you get that Target romper and do you think it's too late for me to find one?! LOVE it! love this set of photos... and anything madewell speaks to my heart... lol! that madewell outfit is adorable!!! Ahhh I'm so happy you did a spring break post! I love how you have a spring break "theme" - all of these pieces play so nicely off each other. Have so much fun! Check mine when you have time! thanks for your sweet comment. i love these outfit photos. I'm crazy for these sequin shorts! Girl, we don't only have the same name, same hobby but the exact same taste in clothes as well! :D Love the polka dots, sequins and cute rompers! Great sets! Love those sequined shorts! I absolutly love these outfits! amazing things!! :D very nice blog!! love the polka dot onesie! thanks for your sweet comment! have so much fun on spring break (i miss those days...) -- your outfits are sooo pretty! That target romper is amazing!! Have fun! & nice clothes! So excited for you! Have an amazing time! i hate packing hahaha!!! its something horrible for me!! love all the stuffs you choose!! great outfits! very jealous you'll be in the sunshine! love the sequin shorts and the bag! ok I simply LOVE the first two outfits!!! The denim in the second one? SO rock chick! you are a tennis player too? great! where are you from? love the black shorts! it's really beautiful. I love the romper & little balenciaga bag :) hope you had a great time!